Paganism is an earth-based religion, and one of the common ways that many Pagans practice their spirituality and honor the earth is by maintaining gardens, where they grow their own vegetables, herbs, flowers and other plants. The bounties of these gardens often make their ways into dishes and teas, and also get used in the making of incense and magickal potions. I grew up in the country, and both sets of grandparents owned farms where they maintained their own gardens. My Grandpa Beach had a strawberry patch where he grew and sell ripe juicy berries in the summer, and a pumpkin patch for jack-o-lanterns in the fall. 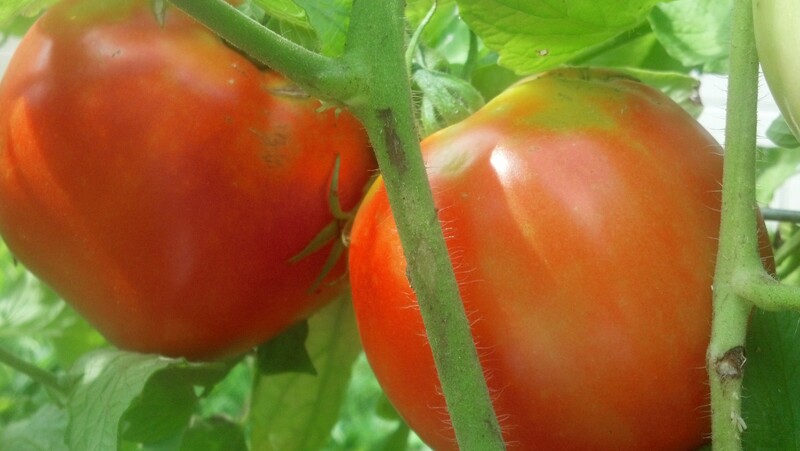 Dad inherited the garden gene, and thus as a child I grew up on fresh homegrown tomatoes, sweet corn, green beans and cucumbers. That gene has been passed on to me, and over the years I had continued the tradition of feasting on the bounty harvested from my own dirt worship. After I bought my cottage in the fall of 2011, I was determined to put in a garden in the back yard. But Spring would arrive and I just never got around to doing it. 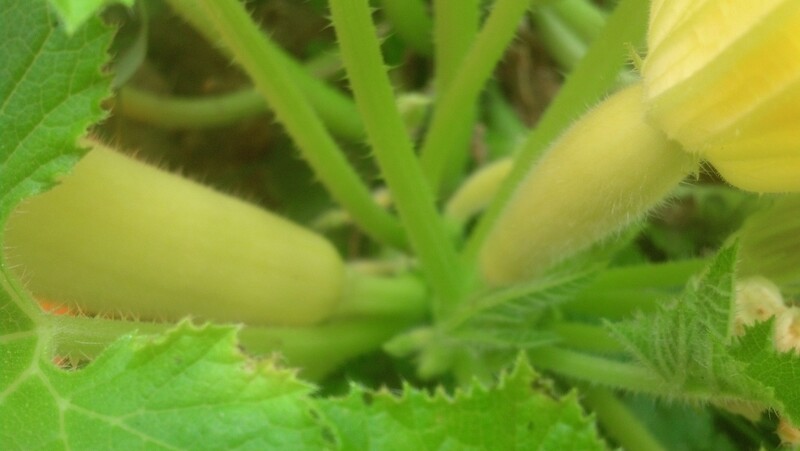 Something always came up, and it wasn’t the squash sprouting from seeds. I didn’t expect this year to be any different – with health problems and other issues, I figured the closest I would get to homegrown would be buying my produce at the local farmer’s market. But then a friend’s son was selling tomato plants as a Boy Scout fundraiser, and I knew this was a sign. It was time to get that garden growing. 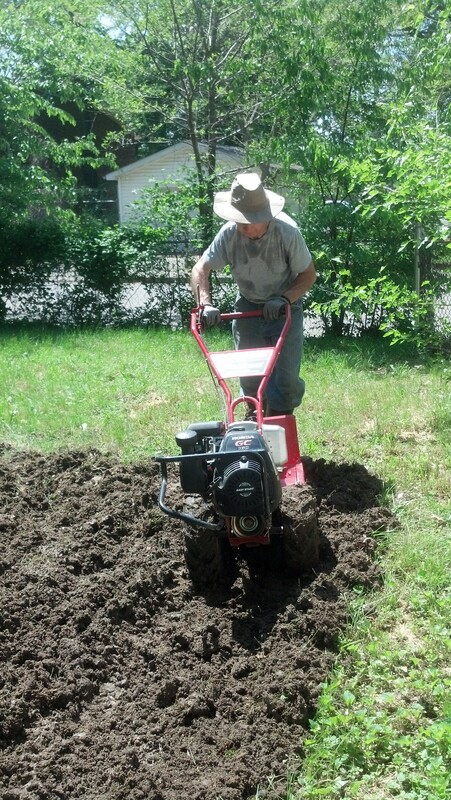 I called upon the services of my friend Dale, who came over with his tiller and dug up a small 10 x 10 plot in the backyard. Not too small, not too big. 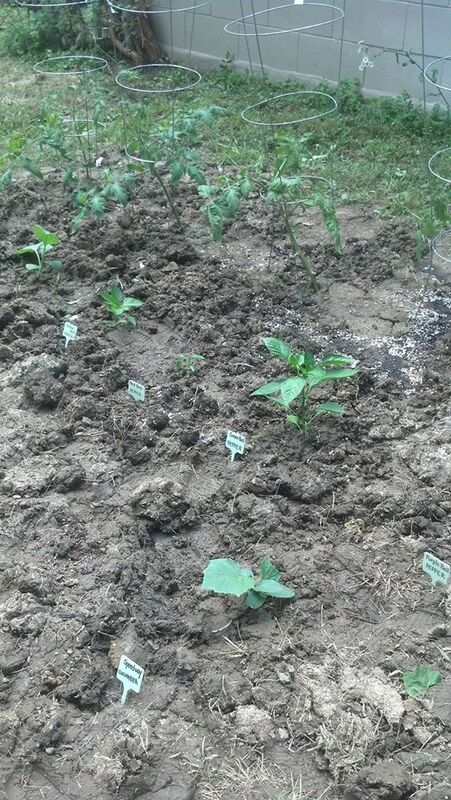 Just the right size for a couple of tomato plants, some peppers and eggplant, and a few cucumbers and squashes. Since this was a “last minute experiment,” I didn’t do much to the soil other than just digging it up. Next year I will do a better job and have some compost and manure and such ready to mix in. 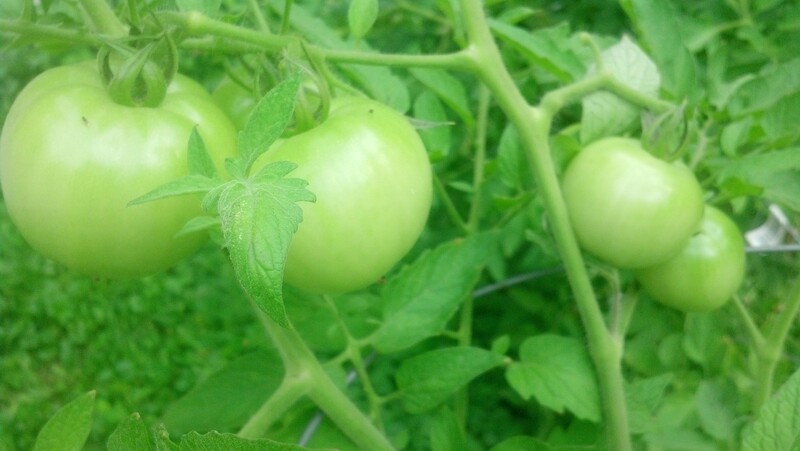 Then I transplanted my tomatoes, along with other veggies I had bought: several varieties of peppers, a couple of eggplants, cucumbers, zucchini, summer squash, and a watermelon plant. Before long, I began to notice that I had a little problem in the garden. A couple of them, actually. And they all had long ears and fluffy tails. Yup, the bunny invasion. I suspect Mrs. Rabbit must have had a nest nearby, for these looked like her youngsters. It didn’t take long for Flopsy, Mopsy, Peter and Cotton-tail to nibble their way into the garden. They totally destroyed my peppers and eggplant, leaving nothing but a tiny little stem. So much for my plans to cook eggplant parmigiana for dinner one night. Next year I’m going to put up a chicken wire fence to keep the critters out. 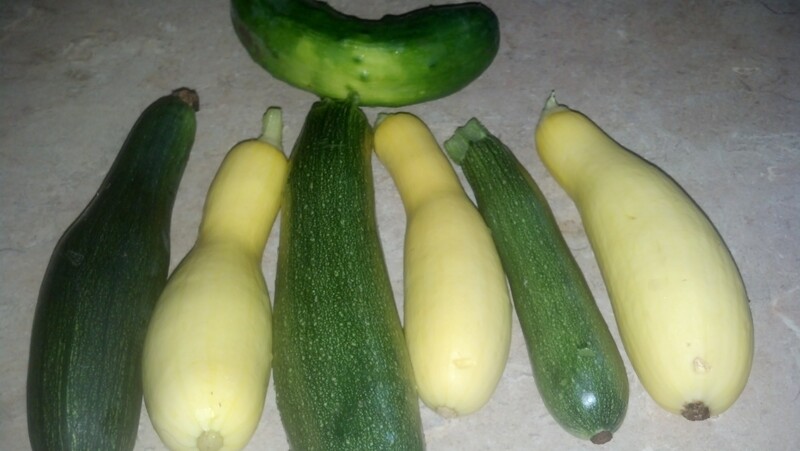 So that left me with only my tomatoes, my cucumbers, my zucchini and summer squash, and my sole sugar baby watermelon. Every day I would go out to visit the garden, hoping that the squirrels and rabbits hadn’t done too much damage, and that I would see some evidence of Mother Nature’s generosity. 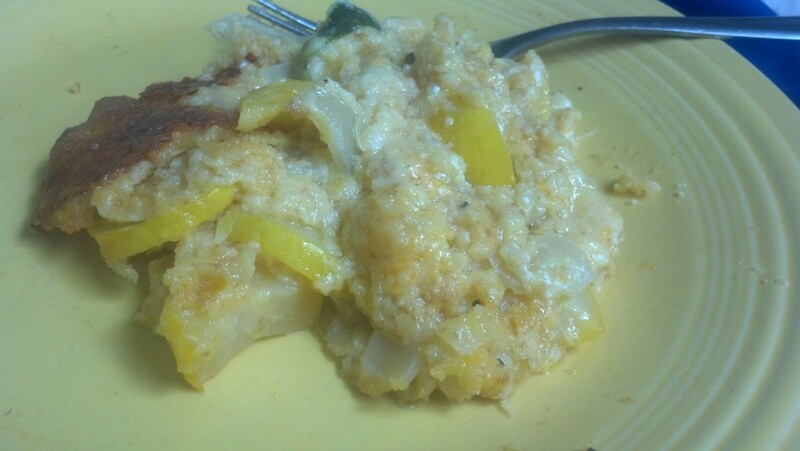 while others became the main ingredient in a squash casserole, made with crumbled up corn bread, sour cream, and cheese. 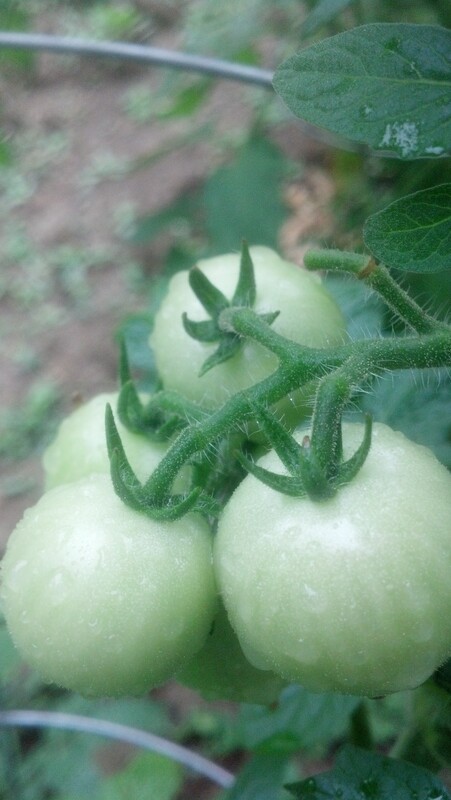 My tomatoes took a bit longer to get going, but soon I was seeing bunches of little green fruits hanging off the stems. 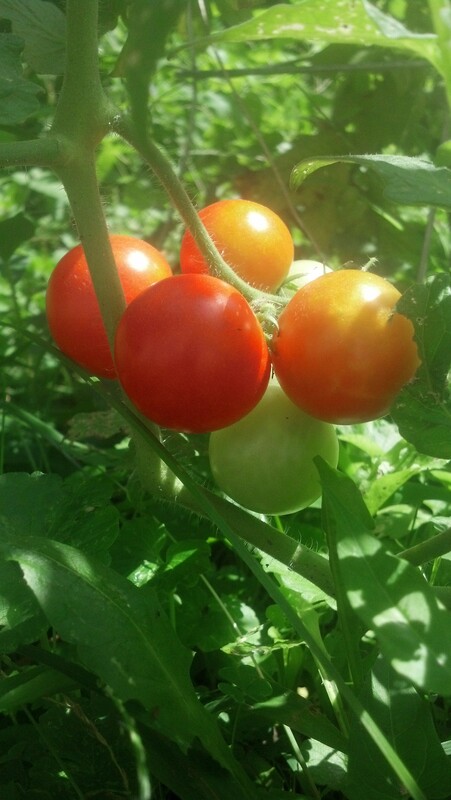 It seemed like it took forever for my tomatoes to ripen, and in the meantime I had to fend off yet another critter – the bushy-tailed squirrels who were determined to steal them for their own dinners. 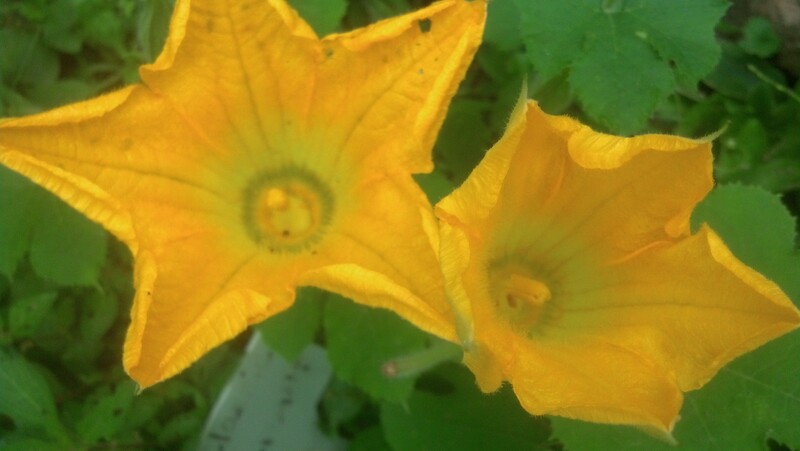 But they eventually left the plants alone, and in the hot August days they finally began to change color. 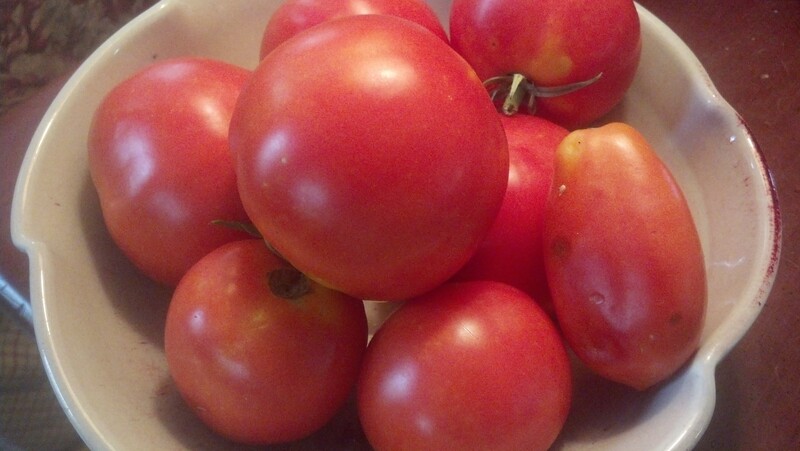 It wasn’t long before I was slicing tomatoes for burgers, making BLTs, and cooking them up for pasta sauce. Or in the case of the cherry tomatoes, picking them straight out of the garden and popping them into my mouth. And what about that watermelon plant? It developed two melons; unfortunately one only grew to golf ball size before being carted away by one of those pesky squirrels. 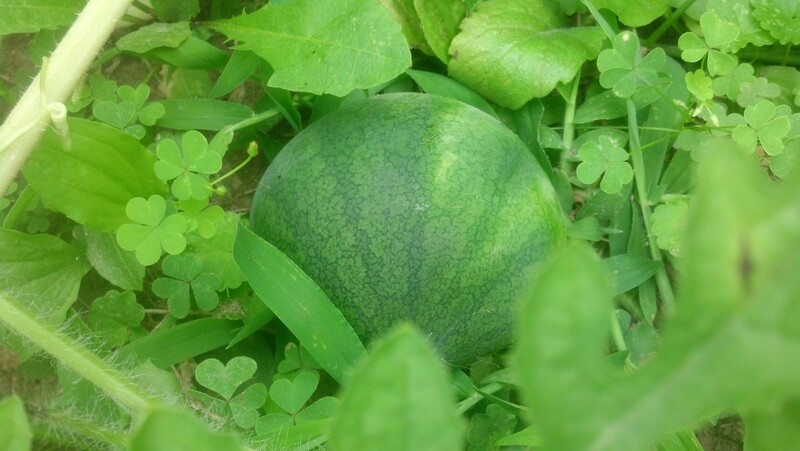 As for the second melon, it grew to full size and ripened, and I just ate it last week. 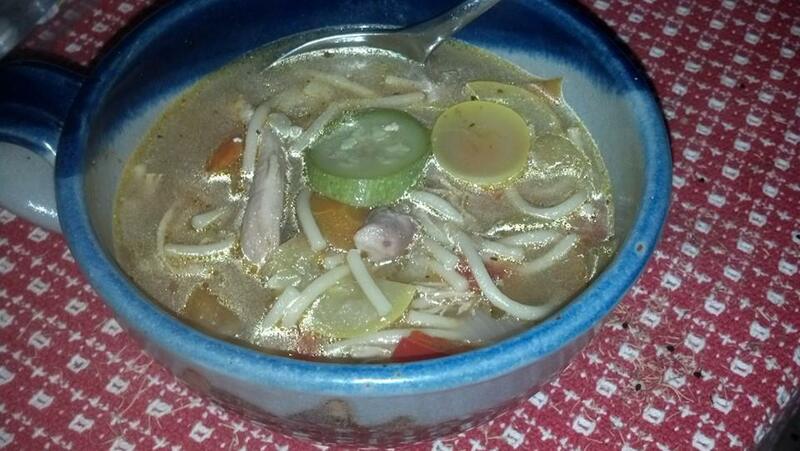 It was delicious – juicy and sweet. For my first attempt here at the cottage, my gardening efforts were a hit and miss. Some of my plants didn’t make it, while others did quite well. Considering that it was a last minute effort and I didn’t put a lot of time into planning and prepping the garden bed, I would say that overall I am fairly pleased with the results. 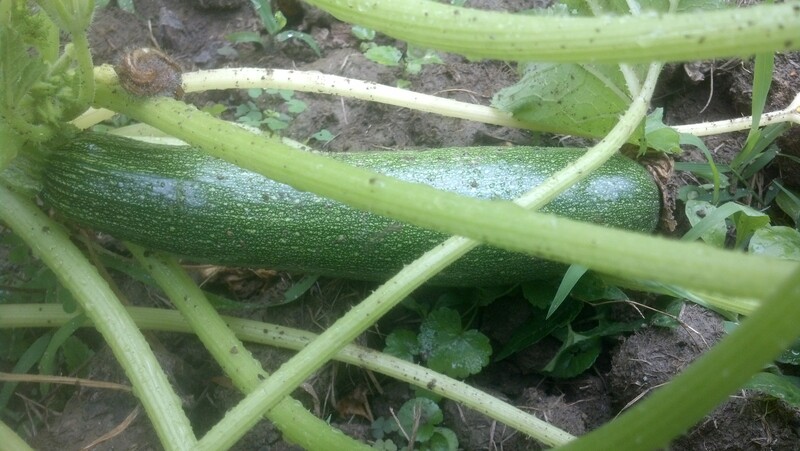 Next year I hope to put more time into it – prepare the bed with natural additives to enrich the soil, propogate my own plants from seeds, and do a better job at weeding and watering. Hopefully this will increase my success. I might have to hire a watchdog to keep the bunnies away.